You may have noticed that there are certain trends that I have stayed away from over the past year. Up until recently, fray and tassels had been one of those trends for me. It's been really popular over the last year...on boots and bags and some shirts. I don't really have anything against it, but it just didn't really appeal to me. That changed a couple weeks ago when this bag, the Stretta, from Embrazio Leather came in the mail. 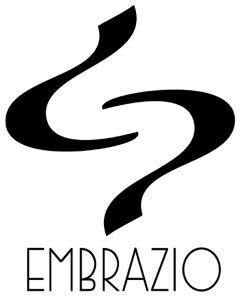 Before I go into bag details I want to tell you guys a bit about working with Embrazio. They are based in Boulder, CO and have been so amazing. Before we started our collaboration, I was able to have a phone call with them... and being able to talk with them about their products and learn the story of the company has been great. So far to date, this is the only company that I have worked with that has wanted to have a conversation with me and learn more about who I am. That says a lot right there. I can't wait to tell you more about this bag! Immediately when I opened the Embrazio box, the leather smelled AMAZING!!! Another thing on the leather, it's super soft, and really high quality....AND it's waterproof. The bag sits on my hip and curls around me, like molding itself to me which is really nice... and it makes it more comfortable and functional. The color I picked is called Bone, and I'm pleased with it. It goes with everything because it's not a stark white. It's like in between white and a creamish grey. It's stylish without being overly trendy. This is an important thing for because I want to be able to keep wearing it in the coming years. I think those are the big things that stand out to meet after wearing it for a couple of weeks now. When I'm wearing it, I find myself playing with the tassels. The leather is just so soft! You will likely see a lot more of this bag on my instagram this spring and summer. It's a great bag to throw on and just go! Other outfit details: Shoes - New Balance for J.Crew, similar on sale here! Shirt - J.Crew Always chambray shirt (one of my go-to's), here. Jacket - J.Crew Downtown Field Jacket (my most worn all-weather jacket), here. 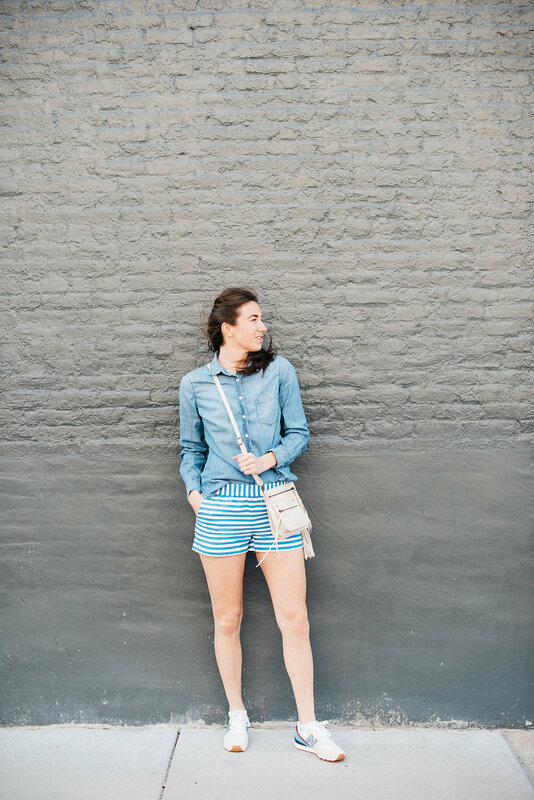 Shorts - J.Crew Factory striped pull-on short, I got these last year and so here is the same style, but they have different patterns this year. I have 3 pairs of these shorts in different colors! So Comfy and cute. This outfit overall is a pretty me to the T, type look. 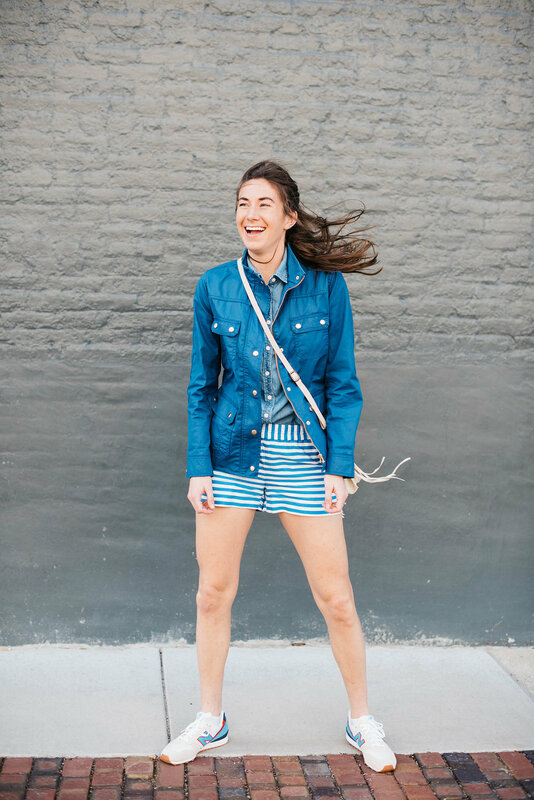 I love all the contrasting blues, it's comfortable and stylish without trying too hard. And like I mentioned above, the chambray shirt and field jacket are my go-to's. I wear them both all the time!! !